It is October, and bookstores are beginning to stock their collections of next year’s calendars. I try to change up my calendar each year to keep things new and get new images to ponder one month at a time. Some people swear by the travel calendars so they can get a dose of "tropical isles," or perhaps celebrate their allegiance to a particular dog breed. I typically choose something artistic, inviting, and something I can look at every day for a year and still find something new in the images. I typically mix different images between the wall and the desk, so that I don't get bored. For 2006, however, I actually broke my rules of variety, and purchased the same wall calendar and desk calendar, but with good reason: René Gruau. I have gazed wistfully at his heroines of chic fashion illustration for nearly a year, and I am thinking I may just have to re-buy the same calendar for 2007. What can I say? The images just make me happy. I have always loved the media of poster art and graphic illustration. The simplicity and economy of design communicates so much with so little. It is the perfect example of designing effectively within constraints. Fashion illustration in particular is becoming a lost art form, with companies relying almost entirely on photography to communicate their branding. One of the last of the genre was Gruau, who illustrated well into his nineties, finally passing away in 2004, after creating iconic imagery for Dior, Balenciaga, Ortalion, Air France, and International Textiles. 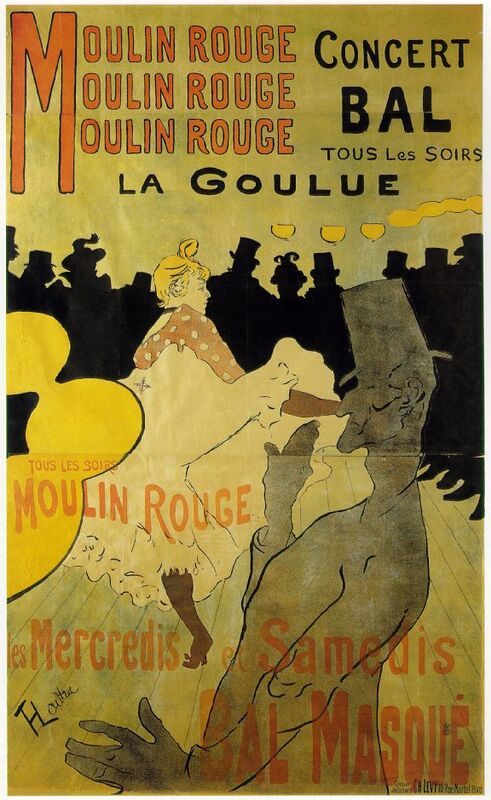 His later work for Moulin Rouge and the Lido de Paris helped to promote the classic Parisian cabarets to a new generation of tourists, yet with an old-world aesthetic. Gruau was the son of a French socialite (whose surname of Gruau he later adopted,) and an Italian Count. His real name & title? : Count Renato Zavagli Ricciardelli delle Camminate. Miss Dior Aside from their incredible height, Gruau women are flirtatious, sensuous, saucy, and innocently invite the voyeuristic gaze – that is, when they aren’t confronting the gaze directly. They are beautifully dressed, their smiles are knowing, and their limbs, like their eyelashes, are long and luxurious. Lingere Christian Dior 1966The lingerie advertisements for Christian Dior are particularly voyeuristic, but are frothy enough to remain adorably appealing, rather than tawdry and “through-a-keyhole.” Every so often, you can find original lithographs of these graphics being sold in some of the bouquinistes along the Seine. One summer my sister and I spotted some, but she prevented me from buying them due to their expense. Coulda shoulda woulda. Air France Cote D'Azur - 1963One of the more iconic images includes the “straw hat” girl for Air France’s ad for travel to the Côte D’Azur in 1963. This is the one my friend Emi loves the most. It instantly conveys the simple romance of a summer on the beaches of France. 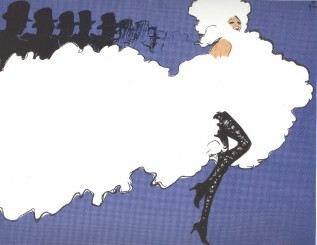 Other than Miss October, my other favorite Gruau images are from his cabaret advertisements. This sketch for a Lido poster from the early 1950s conveys the classic glamour of the can-cans, while it celebrates the traditional poster-art graphics of Bonnard and Toulouse-Lautrec, who created this form of illustration during the Belle Epoque. Yet this art derives its hard-line aesthetic from the influence of Japonisme, and it’s flattened, cartoon-ish forms. His use of diagonals and vertical compositions, as well as empty spaces to contrast with thick lines, create an illusion of movement and lightness rooted in Japanese wood-block prints. Gruau mixes both Bonnard and Toulouse-Lautrec’s images in this sketch, with the single black line delineating a crowd of onlookers, while the froth of the dancer’s feathers trails away like champagne foam. Chat BembergGruau also illustrated textile advertisements, and captured pattern and texture with a few strokes of the brush. Always, his same economy in bright colors and rhythms that are compelling and unforgettable. With the exception of Michael Roberts, fashion illustration has hit an all-time low. Of course, The New Yorker still leads the way in classical illustration, with only a few periodicals reaching for creative graphics every now and again. Advertisements are hard, dark, and more often than not, a bit vulgar and difficult to look at for any length of time. Gruau created images that you wanted to hang on your wall - their sheer simple genious and elegant draughtsmanship served to transport you to other eras and other moods. It is with a heavy heart that I will relinquish my Gruau calendars at the end of the year - what other images could I possibly find that will take me so far away from my daily grind with just a brief glance? Where to find the same freshness, the exuberance, the bubbly enthusiasm that carries me on an effervescent wave of chic? Who but Gruau offers this kind of happiness with just a paper calendar?